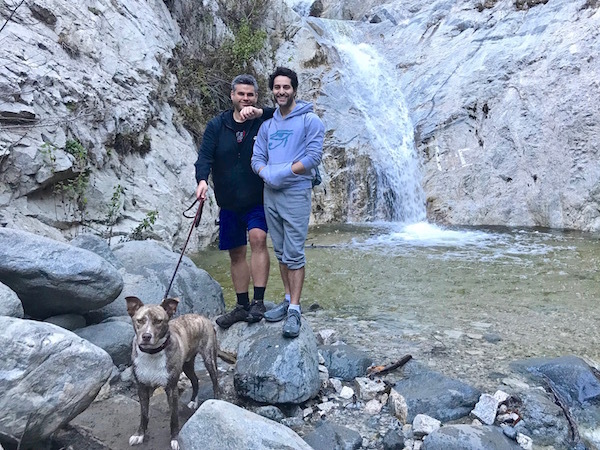 JJ Saw His First Waterfall… and There’s Video! | Keep It Up, David! 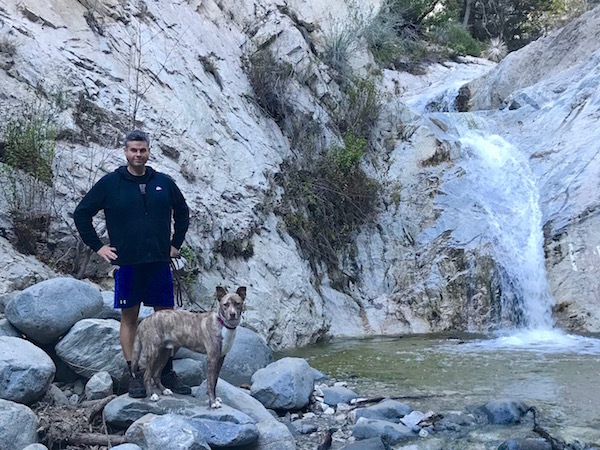 I took JJ on a great hike to Switzer Falls. And here’s the little YouTube video of JJ splashing around in the pool, fetching sticks! Spoiler alert: It’s adorable. JJ loves water, and had a blast. 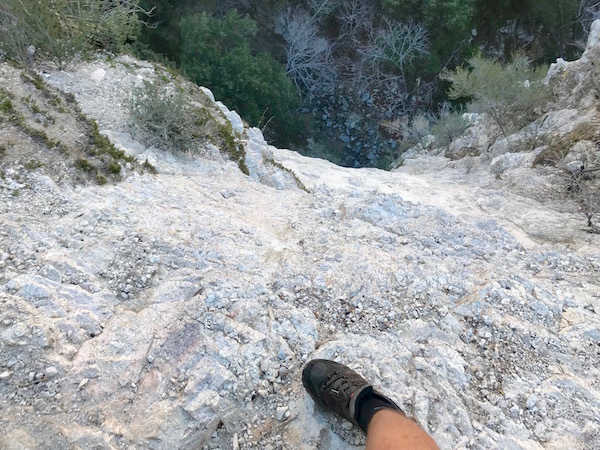 I had a blast too – what a great hike! My friend Tavi came along, too, and we drove up into the forest to the Switzer Falls Trailhead. Most hikes in the area start at the bottom of a hill or mountain, but this hike was different. It started at the top, and we hiked about 2.25 miles down to the waterfall. Much of the trail was following a creek, and we had to cross the creek about a dozen times to keep following the trail. There were lots of logs and rocks to aid in crossing the creek, but I still got wet. Plus, JJ was plowing through the water whenever he could, whether we had to cross or not! 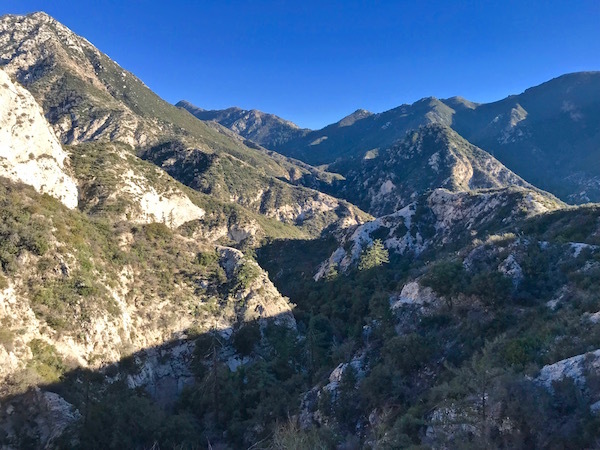 Then the creek drops into a high-sided canyon as it approaches the top of the falls, and the trail goes up high onto a ridge. The views were stunning. And there were some narrower parts, too, with dangerous drops! The trail then descended back into the canyon, and we hiked upstream just a short while, less than a half a mile, until we reached the falls. There’s another, bigger waterfall further upstream, too, but you have to scramble up rocks and to get there (no trail), and we were there in the afternoon, and wanted to make sure we got out before it got dark, so we didn’t explore further. Another group of hikers were arriving as we left, so one of them took a picture of all three of us. And we had a little snack before starting back up to the ridge. 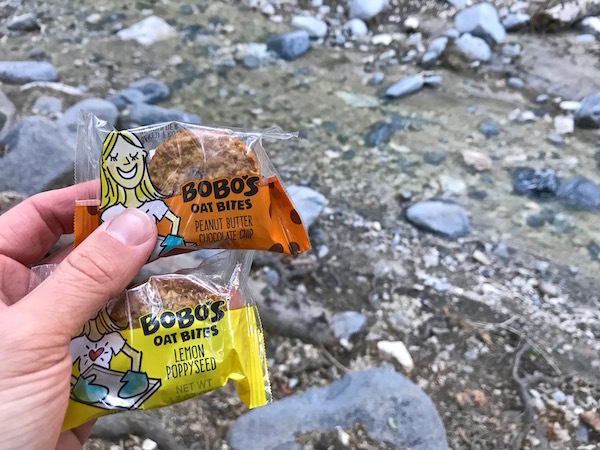 I brought two flavors of Bobo’s Oat Bites – Lemon Poppyseed and Peanut Butter Chocolate Chip, and Tavi and I split them in half so we could eat try both. I preferred the Lemon Poppyseed – which is wonderfully lemony – but both were good, hearty, easy to pack, and satisfying. The hike was 4.6 miles, took about three hours (with ample waterfall time), and my heart rate monitor says I burned 1,253 calories. (I’m not sure I believe that.) Regardless of calorie burn, it was an excellent workout. I had another excellent workout the very next day. 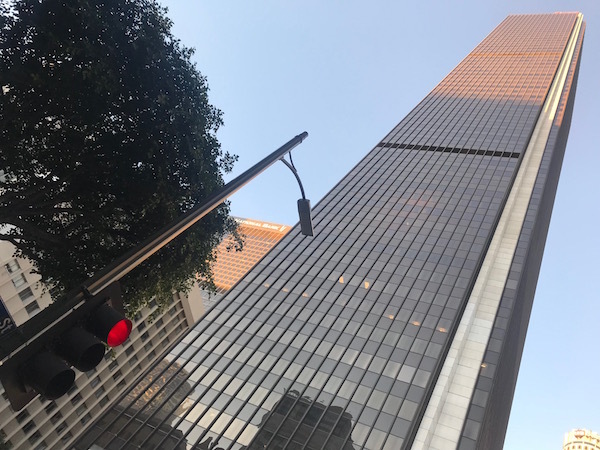 I went from the middle of nowhere to the heart of downtown Los Angeles, where I climbed stairs in a skyscraper. …and two more without it. That’s 204 stories, in about 95 minutes. 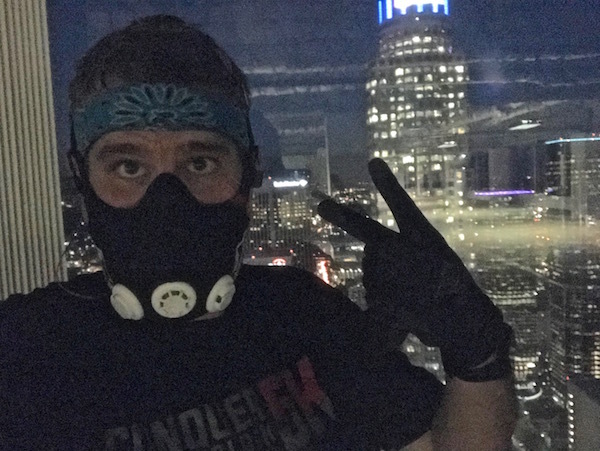 The elevation training mask makes an already challenging activity even more challenging, and I wanted to do all four climbs with it on, but after two I was really struggling, and decided to take it off. I left there thinking that it wasn’t a great workout for me, but I readjusted my thinking while sitting on the train for 25 minutes to get home. I had just climbed 204 stories. I climbed 102 of them wearing a torture device that restricts my breathing, that I hadn’t used in nearly a year. And that’s not good enough? NO WAY. I showed up, killed it, and am just priming the pump for future training sessions. 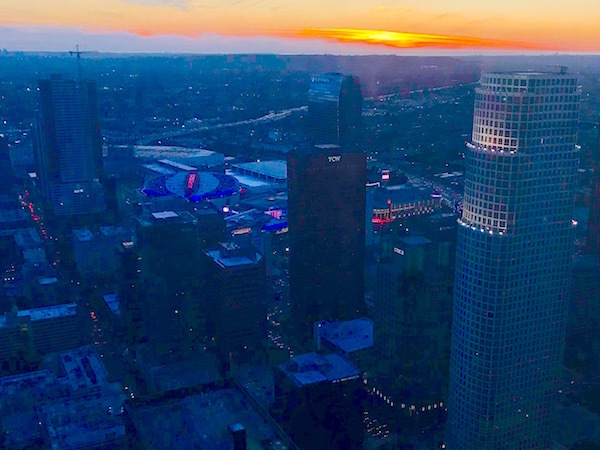 Plus, I made it to the top after my first climb to see that last beautiful moments of a glorious sunset, from the 55th floor. That can’t be beat! This entry was posted on Sunday, January 27th, 2019 at 6:48 pm and is filed under Uncategorized. You can follow any responses to this entry through the RSS 2.0 feed. You can leave a response, or trackback from your own site.